My husband has been taking advantage of me being home lately and with that comes some dinner requests. I don't mind at all because soon enough, it will be back to the kitchen and long hours at the restaurant. So it's been known that my husband is a shrimp fanatic and any dish involving shrimp is sure to make him happy. 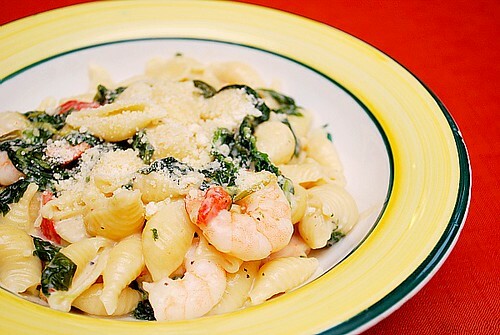 This Shrimp Alfredo with Spinach & Roasted Red Pepper satisfied our cravings for shrimp and pasta, brought together with a silky rich alfredo sauce. For added color and flavor, spinach and roasted red bell pepper were added to the mix. It definitely hit the spot and was added to my husband's list of favorites! Place egg yolks in a separate bowl and slowly whip in a portion of the hot milk and cream mixture. Slowly add egg yolk mixture back into remaining cream mixture. Place back on very low heat and continually stir until simmering. Take sauce off heat so it thickens. (This will increase temperature of egg yolks, known as tempering). Season to taste with salt and black pepper; set aside and keep warm. In a large skillet, saute shrimp and garlic in the butter for about one minute. Add the spinach and red bell pepper, sautéing until warmed through. Add the cooked pasta and ladle in the prepared alfredo to your tastes. Continue to warm over low heat until fully warmed through and serve hot. I have to tell I am a big fan of seafood, especially shrimps since they are so easy to prepare. This recipe sounds delicious and I can’t wait to try it.